New research suggests that much of the material that made life possible on Earth arrived after a cataclysmic collision between our planet and a Mars-sized object billions of years ago—likely the same collision that produced the Moon. For life to emerge on an otherwise dead planet, an assortment of chemical compounds, or volatile elements, are required, including carbon, nitrogen, and sulphur. Conventional thinking has it that Earth’s volatile elements arrived through the steady bombardment of ancient meteorites. New research published today in Science Advances proposes an alternative delivery mechanism: a catastrophic collision between Earth and a Mars-sized object, sometimes referred to as Theia, some 4.4 billion years ago. This hypothetical collision, which would have happened while our planet was still forming, seeded our baby planet with the volatile elements required for life, according to the new paper. What’s more, the lead authors of the new study, Damanveer S. Grewal and Rajdeep Dasgupta from Rice University, say it’s the same planet-on-planet collision that formed the Moon. For many astronomers, geologists, and astrobiologists, the notion that Earth’s volatiles arrived on the back of primitive meteorites has never been completely satisfying. Our planet, along with other rocky planets in the inner Solar System, is naturally bereft of volatiles. It just so happens that the isotopic signature of Earth’s volatiles match those seen in carbonaceous chondrites, the class of meteorites typically cited as being the deliverers of volatiles to Earth. Problem is, the volatile element ratios, such as carbon to nitrogen and water to carbon, in Earth’s silicate, mantle, crust, ocean, and atmosphere are out of whack with what’s observed in chondrites, leading to the so-called “isotope crisis” and doubts about the meteorite-seeding theory. The new study is interesting in that it offers a solution to this problem—but instead of invoking a plethora of small meteorite strikes, the authors proposed a single, gigantic collision between the Earth and an ancient planet. The basis for this claim comes from an experiment in which the researchers attempted to mimic the conditions of this impact in the lab. The study involved high pressure and temperature experiments, along with computer simulations fed with the information gleaned from these experiments. Through this modelling work, the researchers sought to determine the size and chemical composition of the impacting planet to see how its reservoir of silicates could have mixed in with the Earth, delivering its various life-essential elements. In 2016, Dasgupta co-authored a similar paper showing how the amount, or fractionation, of carbon and sulphur within the silicate of our planet could be explained by a gigantic collision with another planet. The new experiment is different in that it investigated the fate of three life-essential volatile elements—carbon, nitrogen, and sulphur—in the wake of a cataclysmic impact involving two young rocky planets, in addition to providing an estimate for the size of the hypothetical impactor. “Carbon and sulphur alone unfortunately cannot provide a solution to the origin of volatiles on Earth,” Dasgupta told Gizmodo. Without nitrogen, Earth’s carbon and sulphur could’ve come from primitive meteorites as well, he explained, because the carbon-to-sulphur ratio of the silicate Earth is similar to those in chondrites. “What we show in the current work, is that when one considers carbon, nitrogen, and sulphur together, delivery via a giant impact or merger of the proto-Earth with a Mars-sized planet is the most likely solution,” he said. To simulate the conditions of this alleged planetary smashup, Dasgupta and his colleagues heated and pressurised materials thought to exist within the Earth during its developmental stage. This was done to replicate, at least in microcosm, the conditions on Earth at depths between 40 to 120 kilometers (25 to 75 miles). These materials, which included silicates and an iron-nickel alloy, were then mixed with sulphur, carbon, and nitrogen, representing the chemical contribution of the embryonic Mars-sized planet. The researchers carefully watched the behaviour of these materials while tweaking a number of variables. Results showed that carbon was less likely to bond with metallic iron that was mixed with alloys rich in nitrogen and sulphur. At the same time, the nitrogen remained unaffected by sulphur. “What they found is that, when there is a lot of sulphur in the system, the element carbon behaves differently than nitrogen and doesn’t go into the metal [i.e. the simulated planet core] as readily, and can lead to a ratio of these elements that matches the modern-day Earth’s ratio of these elements,” James Day, a professor at the Scripps Institution of Oceanography who wasn’t involved with the new study, told Gizmodo. The researchers also showed that volcanic glass on the Moon and bulk silicate of Earth (the stuff surrounding the core) have similar isotopic signatures, pointing to a common origin. 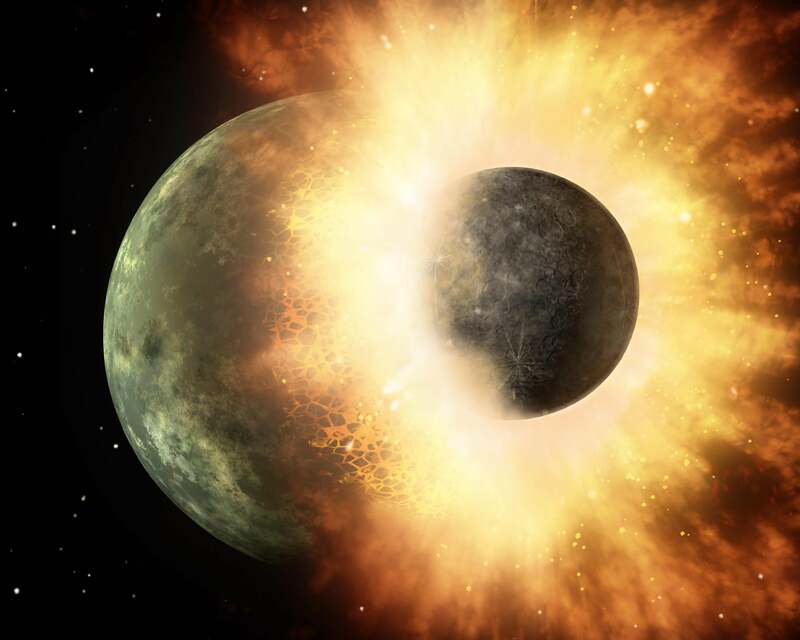 The most likely explanation, the researchers argued, is a massive impact with a Mars-sized planet, a collision that not only delivered most of our planet’s carbon, nitrogen, and sulphur, but also produced the Moon. “Our study challenges the existing models of volatile element delivery methods,” Dasgupta told Gizmodo. “It also solves the long-standing problem that the volatile element ratios of the surface layers of Earth are distinctly different from the planet-forming building blocks that we know as chondrites.” Day described the new study as “thorou gh,” saying the authors are “experts in experiments to understand planetary processes,” which in his mind “is really what this paper is about.” Indeed, the study was based almost exclusively on experimental evidence and modelling, requiring the authors to make several assumptions. As Day explained, for example, the materials that formed the Earth may not have been absolutely identical to the ones used in the study. As for comparing the nitrogen and hydrogen within lunar volcanic glass to the composition of Earth, and then claiming a common origin, Day was likewise unconvinced. More evidence will be required to prove the provenance of Earth’s volatiles—and also the nature of the Moon’s formation. The giant impact hypothesis, first proposed by Canadian geologist Reginald A. Daly back in the 1940s, is one of many, and the debate remains unresolved.